Earlier this month, Cornell University’s applied sciences graduate campus Cornell Tech broke ground on its new $150 million, 270-foot residential high-rise in New York City. When the Cornell Tech building is complete in 2017, it will also break metaphorical ground as the tallest passive house building in the world. The residential high-rise is part of Cornell Tech’s new 12-acre campus on Roosevelt Island in the East River between Manhattan and Queens. Passive house buildings are heavily insulated, airtight and highly energy efficient. They require far less energy to heat and cool, reducing their carbon footprint and their long-term operating costs. The Cornell Tech residential building will have 352 units in 26 stories, beating out the world’s first and current tallest passive house high-rise, a 20-story office building in Vienna, Austria. The facade will be constructed with a metal panel system that acts as thermal insulation. The windows will be triple-glazed to also improve insulation. It will use energy recovery ventilation (ERV) units, which constantly circulate fresh air while capturing and reusing the heat of inside air to heat up outside air as it’s brought in. According to the designers, the Cornell Tech building is projected to save 882 tons of CO2 per year and use 60 to 70 percent less energy than a traditionally constructed building. Klein says they plan to pass some of those savings along with below-market-rate rents in the units. As is often the case with early adopters, Cornell Tech’s designers and developers ran into some challenges. Though passive house standards have been used widely in Europe for single-family homes, low-rise multi-family buildings, schools and offices, in the U.S. they have primarily just been used for single-family homes. Beyond materials, the project has run into roadblocks with lagging building codes. “This is not typical construction practice and building codes don’t necessarily have the same models that passive house design and construction would have. We had to get a number of variances for mechanical systems for fresh air systems and such,” says Klein. Cost has always been a limiting factor in passive house construction. According to Passive House Institute U.S., passive house buildings cost 5 to 10 percent more than traditional construction. But Rosenberg says the cost burden is actually less severe for their high-rise than it might be for a single family home. “We haven’t built the building yet so it’s hard to speculate on the overall cost. If I had to loosely guess it is probably a 3 to 5 percent cost increase, definitely not 10 percent. When you have a larger structure you’re obviously able to spread the cost among the entire square footage of building,” she explains. 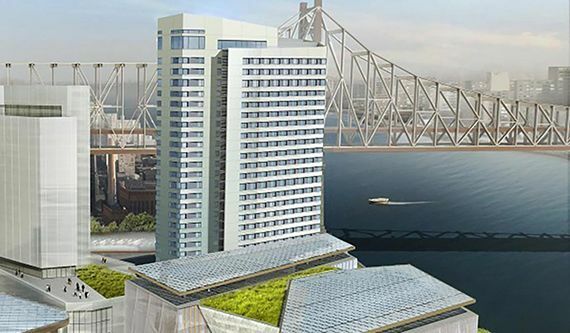 With construction just beginning, it is too early to say Cornell Tech has worked out all the kinks, but Klein is hoping their experience with cost, permitting and materials serves an example for other developers considering passive house high-rises. Mike Eliason, a passive house consultant and designer in Seattle, says the passive house world will be watching to see if Cornell Tech’s building succeeds. “I think for a developer to take this on is a pretty huge deal … not just in the U.S., but globally. It’s going to be a good demonstration project,” says Eliason.